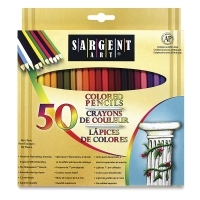 These economical colored pencils are ideal for artists and illustrators of all ages. They contain high-quality pigments for consistent color coverage and smooth color laydown. Use them for drawing, illustration, and special effect blending. Color-coordinated cases are made of premium wood for durability and easy sharpening. Pencils are 7" long and pre-sharpened, with 3.3 mm leads. Classroom Pack of 250 — There are 25 each of ten colors, including Black, Blue, Brown, Dark Green, Light Green, Orange, Pink, Red, Violet, and Yellow. Set of 120 — This set contains three of the seven most popular colors and two of the remaining colors for a total of 120 pencils. There are 56 different colors included in this set.